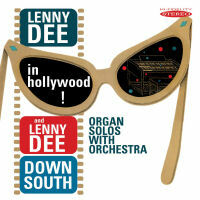 Organist Lenny Dee, the popular entertainer whose many TV appearances and zany interpretations endeared him to the American public was once described as "bringing the organ out of the church and into mainstream music". Dee's popularity was such he had in excess of over 50 albums released over a 20 year period. This CD features two complete albums first time on CD with the addition of bonus tracks - "Dee in Hollywood" has him performing some of the greatest motion picture melodies and themes ever written such as Around The World, Over The Rainbow, Blues In The Night, Never On Sunday, etc. and on "Down South" Dee performs classics associated with the South such as Georgia On My Mind and Carolina In The Morning.